5 STARS I loved The Rebel Princess. It takes the fairy-tales we know and shakes them up. It is creative, lovable characters, fun. I laughed and gagged along the way. Raven Perilous is a princess but her father's side is evil. She has perfect hair all the time, and cute. She wants to be mean.She has a family curse, lives in a magical house. Raven has been preparing to be able to rescue herself. She does not want a Prince to rescue her. Edgar is Raven's twin brother. He gets to do magic. They go to middle school. One day Prince Charming shows up at school. He is the enemy. He recognizes her evil Perilous side. But not her princess side. Then things get out of control. The setting is the real world where her parents escaped too. Also the Fairy-tale land. You never know who you will run into next.I enjoyed reading The Rebel Princess. It is charming story with dragons, knights, witches and fairy god-mothers.Any age can enjoy reading this story. It has something for everyone. I would read other books by Janice Sperry based on The Rebel Princess. I was given this book to read for the purpose of reviewing it and being part of its blog tour. What does a princess do when she doesn't want to be a princess?She REBELS!What a FUN book!Multiple fairy tales and other literary references woven together in a FANTASTIC journey of accomplishing THE QUEST :)Princess Raven Perilous knows that nice princesses get locked in towers.So she wisely chooses to be evil.Then a new boy show up at school...His name?Eric Charming (Prince Charming)...aka...the nemesis!She is not in distress! Nor does she need saving!But when Eric shows her the true identities of some of her schoolmates and teachers...AND...When they get thrown into the enchanted forest...WELL...You will have to read to see what happens~"Loyalty, heroism, and a pinch of enchantment" await!SO. SO. SO. GOOD!DON'T MISS OUT ON THIS ONE!LOVED IT! Funny and fun! This one might be middle grade, but adults will enjoy it too, especially those who enjoy fractured fairy tales. The dialog is especially well done. The Rebel PrincessBy Janice SperryThis damsel is NOT in distress!Raven Perilous is the Rebel Princess. No she's not trying to over-throw any sitting royalty. She simply doesn't want to be a typical fairy-tale princess just waiting for Prince Charming to rescue her. And kissing a prince much less any boy is just plain icky!Raven has your typical problems - a mother who speaks gems and jewelry (literally), a father who is a wizard, a house that's moody, a twin brother who takes after their dad. And Raven has this habit of being a little bit mean and nasty when she talks to others and this has an unexpected disgusting side-effect (thanks to a fairy godmother).But life is good until a prince shows up one day. One disaster after another ensues and the only way to lift the curse/spell is for the "prince" and Raven to work together. But is that even possible?This is a fun mishmash of fairy-tales run amok as Raven tries to stay out distress and the prince tries to find true-love. But they are trapped in a land of enchantment and fairy tales, so the fun is just beginning.This is a delightful and funny twist on your favorite fairy tales. And the twists and turns that ensue as Raven tries to return home will give you a great lift and several laughs.This is one Rebel Princess you will love from page one. Raven may not be the perfect princess but she's one your preteens and tweens will relate to.I was provided a digital copy of this book is exchange for my honest review. Aw, this book was so cute. A middle grade level read for sure, clean and did I mention cute? This is a book perfectly geared for the pre-teen as the main characters are about 13 years old.Princess Raven has been living in the "real world", trying to avoid being locked in a tower. She is not very nice and has been cursed to spew frogs and slugs when she says unkind things. EEWWWW! Despite trying not to be very nice, Raven really is a good girl. She tries to obey her parents and in the end, she does figure out the whole nice thing. Raven isn't your typical princess (grunge is more her style) but she is endearing even when she is being a little bossy.Raven has an evil twin brother (who really isn't so evil) and when she meets Prince Charming the three of them are sucked into fairy tale land and thus begins a magical adventure together. Prince Charming loves his sword, has been put under a spell to turn into a rat and isn't so very charming. They meet all kinds of fairy tale creatures on their quest to get home- dragons, tooth fairies, princess's, the muffin man and many more. The three young royals have to learn how to work together and get along. Luckily they have a little bit of help along the way.I thought this book was cute. (I think I've said that before?) It's fun and young readers will really enjoy this light hearted read. My 11 year old daughter will be a perfect fit for this book. I'm adding it to her summer reading list! I really really loved this book. I read it as an advanced reader copy and then went out and preordered it as soon as possible so I could own the actual print book. Such a cute story. Clean, creative, funny, entertaining. I'm a grown woman and still loved this young main character and want my kids to read this book. Raven is a princess. Daughter of a princess who was saved from a tower by an evil sorcerer who fell in love with her mom and they escaped to the real world. She has a twin brother who is considered the evil twin because he can use magic and takes after the dad. Raven doesn't want to be a damsel in distress like her mother had been. She wants to be evil like her brother, who really isn't evil, and then we meet Prince charming who had been trapped in time by Raven's father after he was supposed to have rescued Raven's mom from her tower. Now Prince Charming thinks he has to come save Raven so he can get back to his magical world, but then we find out there are fairy godmother's who don't really do a lot to help but more to add extra problems and entertainment. Overall, it's just really cute, with fun twists and creative license and bending and blending some of my favorite fairy tales out there. I never once guessed what was coming and was pleasantly surprised by all the fun things brought out in this story. Very cute. Perfect for young or young at heart readers. I highly recommend it. This book was funny, cute, and clean. 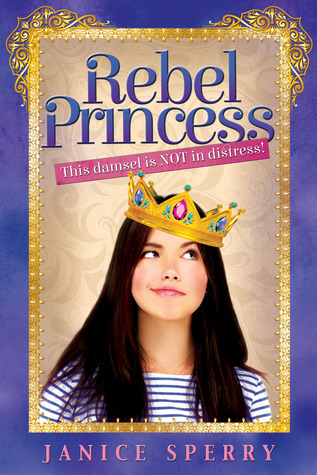 Perfect for middle grade, Rebel Princess has a great message and fun characters. Princess Raven lives in the "real world" were she is determined to be anything but the typical princess. She refuses to be sweet, pink, and perfect (even if her never less than perfect hair didn’t get the memo.) The other thing she refuses to be is rescued. No knight is shining armor needed for this princess. Raven will repel down her high tower before waiting on any prince. Of course it would be easier if she could keep her shoe from falling off.Despite all Princess Raven’s planning and training, she finds herself with a prince and a quest back in the Enchanted Forest (where all fairy tales are from.) Through all the adventures and trials Princess Raven has to figure out how to work with others, that maybe a prince isn’t all bad, and that maybe, sometimes being the mean girl is worse than being the sweet girl (but still no pink. )I thought this book was cute and humorous. Young readers will enjoy the adventure and comedy in this light hearted book. This fractured fairy tale is a fun book to read. It is perfect for the middle grade/tween reader and older.Raven is the daughter of a Princess and an evil warlock. She has grown up in the real world after her parents escaped the fairy world. This was after her father saved her mother from a tower. Raven and her twin find themselves pulled into the Land of Fairy. Reven has spent her life trying to be evil, even though she is a Princess. She wants to escape her mother's fate, she will not be imprisoned in a tower, that only happens to someone who is good. So instead she has toads come out of her mouth when she is mean.Prince Charming finds his way into the real world. Raven does not want to be rescued, she will do the rescuing. I enjoyed this book. It is about a tough girl who shows the world an attitude. Underneath it all, she can't escape who she is, a Princess. The book has action, adventure, and is good clean fun. Raven is not your typical princess and as much as I love princesses, this was refreshing! I loved the way Raven is so confident in herself and how she tries so hard to help herself before asking for help. She isn't helpless and meek at all. The love-hate relationship between Raven and her twin brother, Edgar, is great! They're so different from one another, yet really there for each other when it counts.One day, a new boy shows up in school--Eric Charming and Raven decides instantly that he's her nemesis. I felt a little sorry for Charming. I loved his "true love." The twists added to the classic characters who showed up in the adventure were a lot of fun. Things can have more than one way to end and this really proved that.This is a perfect middle grade book for those readers who love good, clean, adventurous fun.Content: no language; mild fairytale-type violence; no romance. Clean! I bought this book for my granddaughter, skimmed through it and found it delightful, but didn't actually read the whole thing. This review is what my granddaughter (age 10) said about it:What did you like or not like? Her: "I liked that Charming turns into a mouse and when they are trapped by the tooth fairies." Me: It's clever and funny. "What did you think overall? Her: "5 stars. It was fun. It had the right amount of everything. Would you recommend it to anyone? Her: Yeah. I already told my friend about it and I'm going to lend it to her.Tell me more about it. Her: At first Raven hates Charming but she crushes on him in the end. Me: There's a character arc. Her: The author explains really well, enough that I wanted to eat the gingerbread house. Me: Good descriptions.There you have it! A fun light readI really enjoyed this read. The fairy tale elements were entertaining and it had a good rhythm. There were elements of the plot that seemed a bit too easy or convenient to be totally believable, (sometimes I had a hard time picturing what Raven's skirt was doing, could a non-magic sword whack off golden necklaces so easily without any danger to the wearer?) but it had its charm. I liked how it ended and all came together in a way hardwired for the main character. There's definitely a bit more that could be developed in future regarding various relationships, so I'll be I interested to see if there's ever a sequel. I LOVED this book! I wasn't sure what to expect from a middle grade novel, but the writing was so exceptional, that even as an adult it was fantastic. This is a fractured fairy tale story that follows the "evil" princess Raven, her sorcerer brother Edgar, and her friends Amy and Erick on an exciting quest through the enchanted forest, where Raven learns who she really is. I loved the themes of friendship and being true to yourself. I wouldn't hesitate to put this into my children's hands, and I have only boys so that's saying something!I did receive an ARC in exchange for my review, but I promise this review is unbiased, and I really do love it as much as I say! With cute and witty dialogue, this story is always fun. Many fairy tales are mixed up in this novel with some strange and quirky fairy tale characters. Raven sees herself as an evil princess, but soon finds many interesting things about herself in The Enchanted Kingdom. When Prince Charming shows up, he finds that he's 14 years too late to save the princess from her tower. The story is full of humor that both you and your kids/teens will enjoy reading. Just when you think you've figured out how this tale should end, you'll be surprised by the many twists and turns that hopefully will lead to a fairy tale ending. What a fun, quick read. My 12 year old daughter is going to love this fun but mixed up fairy tale. Very cute, funny and just plain adorable. Great characters and surprises around every tree of the Enchanted Forest. Full review coming soon to both blogs. Loved it!Mixed up fairy tale for the modern world. This damsel might be in distress but she can handle it with a little help from friends and family. This book kept me laughing and wondering what disaster would happen next. Let's just be honest, I don't like princesses. So when I saw this book, I was like, "great. A princess book". This book is awesome though. The princess is a rebel princess.